The Belt and Road is about international co-operation. Hong Kong is highly international. Some 8 000 Mainland Chinese and foreign companies have set up their offices in Hong Kong, including 75 of the world's 100 largest banks. Hong Kong is also open, very open to international co-operation. We have no capital control. Indeed, the Heritage Foundation has ranked Hong Kong the world's freest economy for 23 years in a row. Financial connectivity lies at the heart of the Belt and Road. Hong Kong enjoys "super-connectivity" under the "one country, two systems" arrangement. "One country" – we are part of China and enjoy the "China advantage". "Two systems" – we practise, so to speak, "the other system" that is not used on the Mainland of China. Hong Kong is China's international financial centre and, at the same time, the world's China financial centre. We have a deep pool of financial professionals of all nationalities. Bankers, lawyers, accountants, risk managers in Hong Kong are well versed in cross border transactions. They understand the Mainland Chinese market as well as regional and global markets. All these have made us the "super-connector" between the rest of China and the rest of the world. Capital, talent, information and market opportunities flow through Hong Kong. We are the preferred destination of capital from the Mainland. We go out to overseas economies together with Mainland Chinese enterprises, and we go into the Mainland together with enterprises from other countries. 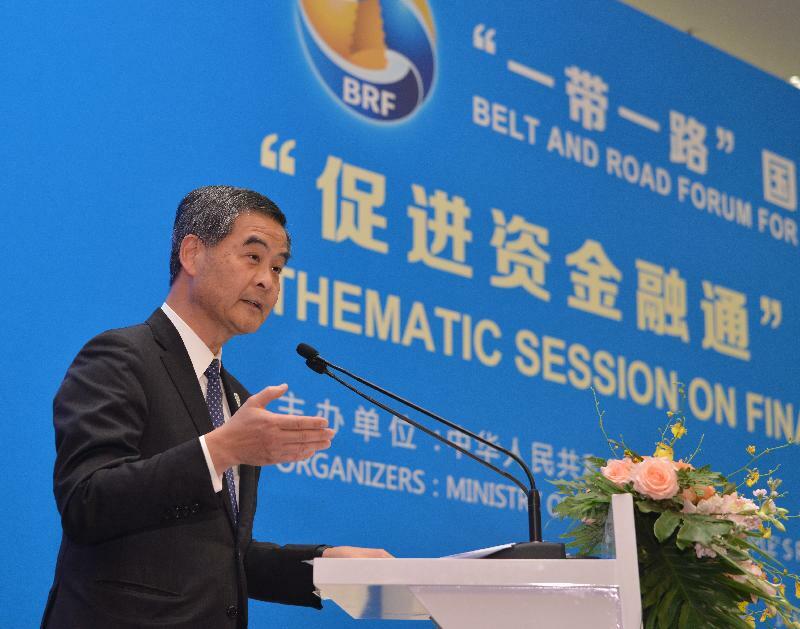 Hong Kong is well-placed to meet the rising demand for fund-raising and financial management services for Belt and Road projects. We top global ranking in fund-raising in initial public offerings, and offer a great variety of financing avenues – syndicated loans, private equity funds, bonds, sukuk and others. We are also Asia's centre of asset and risk management, insurance and re-insurance, and corporate treasury services. We have the ability to carry out project finance in both public and private markets. Furthermore, we have the ability to manage both the construction and the operation of infrastructure projects. My fellow speakers have spoken about the importance of having high quality infrastructure projects. And we need good project management and operational management work to make sure that the infrastructure projects are of high quality and remain of high quality. Indeed we now operate our Mass Transit Railway Corporation (MTRC), the MTRC now operates railways outside of Hong Kong, in the Mainland of China, in the United Kingdom, in Sweden and in Australia, for example. The total number of passengers handled on these railways managed by the MTRC of Hong Kong on a daily work day average basis is about 5.5 million people. We also have the ability to assemble syndicate finance, identifying potential investors from the Mainland of China and the region; the ability to raise green financing; and the ability to access a large number of Mainland investors through the Stock Connects with Shanghai and Shenzhen. Hong Kong has become by far the world's largest offshore Renminbi business centre. As the Renminbi becomes increasingly popular as a financing and transaction currency for Belt and Road projects, Hong Kong stands ready to offer our services to investors around the world. Beyond financing, we are encouraging the growth of new financing activities. We have, for example, just introduced a legislative proposal on tax concessions for qualifying aircraft lessors and leasing managers. And in maritime services, as well – from financing to insurance. And let me just add that Hong Kong is right at the heart of a strategic point of the 21st-Century Maritime Silk Road – namely the Guangdong-Hong Kong-Macao Bay Area. This Area, covering 11 of the more prosperous cities of China and a total population of 66 million, presents huge and fresh opportunities for all. A development plan for this Bay Area is being jointly prepared. In this new regional co-operation initiative, financial services will be Hong Kong's key strength. Ladies and gentlemen, we look forward to working with you all, serving your needs, sharing our opportunities, and, together, contributing to the new prosperity under the Belt and Road Initiative.